I first saw West Side Story at a drive-in theater when I was four years old. I most recently saw it on the big screen at an NCM Fathom event at my local multiplex. Really worth it. Even at four years old, I thought Richard Beymer was a dud as Tony… and I still do. But wow: the choreography and music still knock me out. For probably a decade of my childhood, part of my Saturday morning routine included taking out my dad’s reel-to-reel tape of the movie soundtrack and threading it through the Sony 4-track deck to enjoy with my Tinker Toys, Matchbox cars, and Lincoln Logs. Yes, I was a weird kid. Explains a thing or two about my adulthood, yes? Even later, when I bought my own stereo system and left home for college, West Side Story was one of the first LPsI bought. I couldn’t live without that in my collection! 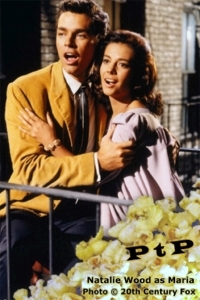 Now, there are still huge stretches of West Side Story that bore me silly… and there’s that Beymer clunkiness, the threadbare Romeo-and-Juliet storyline, and the ridiculous I’ll-die-for-you-even-though-I-barely-know-you love affair. But what keeps me coming back is Leonard Bernstein’s music and Jerome Robbins’ choreography. Robert Wise’s direction is also worth noting. In a behind-the-scenes chat that ran prior to the Fathom screening (and which is included, I believe, on the 50th Anniversary Collector’s Edition Blu-ray/DVD set), TCM’s Robert Osborne sat down with voiceover artist Marni Nixon, Best Supporting Actor winner George Chakiris (Bernardo), and producer Walter Mirisch to talk about the genesis and execution of the project. Oddly enough, in spite of my immersion in the film over the years, I hadn’t realized that choreographer Robbins had also shared directorial duties with Wise—or that Robbins had been fired from the film for creative differences prior to the end of shooting. According to Mirisch, while Wise and Robbins worked exceedingly well together, the pace of filming was simply too slow and too expensive. Chakiris pointed out that only a couple of the major choreographed sequences (including the community dance at which Riff calls a war council with Bernardo) had not been completed prior to Robbins’ firing—which led me to watch that sequence very carefully. It appears that a cinematic effect I had always attributed to Wise, who edited Citizen Kane and also directed the Oscar-winning musical The Sound of Music, was apparently the influence of Robbins. The specifics of choreography (and score) aside, what I have always loved about the filming of West Side Story is the way in which the camera captures the choreography. Most musicals frame a shot, and then keep the choreography in view of the camera; in other words, the dancing is staged for the camera. What happens in most of West Side Story, however (that community dance as a notable exception), is that the choreography is staged not for the camera but for the space available in the streets and sets—and the camera is positioned in such a way that the heart of the choreography, and not all of it, is captured. In other words, the camera is not the primary focus: choreography that makes sense for the story is. The effect is that, when choreographed sequences start, dancers come and go in the frame—just as they do in the rest of the picture. The sequences feel like part of an organic whole rather than show-stopping set-pieces that most musicals feature, such as those made famous in Busby Berkeley spectacles. And here’s the thing: You’ll never beat “Cool” as a show-stopping dance number. Its heightened unreality has been completely set up by the archness of everything that has preceded it—so by the time you get to the over-the-top staging and melodrama of the dance, it makes perfect sense within the world of West Side Story. And what dancing! What passion! What delirious nonsense! But what staging, and what restraint Wise and Robbins exercised in keeping the camera as a supporting character in the filming here rather than as the star. West Side Story is now included with your xfinity subscription. You can also stream at YouTube.